Today is my younger brother's birthday! It is tough to reminisce about his special day because it's been a month and I have not called or send them a text (for some reason). I say it is tough because I had been depressed about him since he got married. I helped him with his schooling all the way through college but he never gave any return or showed any appreciation to me. He got married without my presence. I gave him everything he wanted but in return I was disappointed in him. To make the story short, he has one daughter already whom I never seen, he got married without my presence, even on his wedding day we shouldered all the expenses. I don't know what to say, but I am just a very good sister to him, I am very disappointed in what he has done with all the help and good life he has experienced during his college days. I can go on more, but I am too emotional remembering his birthday. I have mixed emotions when I think about him. First, I am happy because he has very cute daughter who's named were the combination of my name and my sister in Korea. She was named "Dezaneth" Isn't that nice name? Second, I feel for him because he got married at a very young age. Fourth, I was very depressed because we had many plans for him. Lastly, I understood that we had our own fate in life. God has plans, HE makes all things happens for a reason. Even I still didn't send them a text or call them, I just want to greet my little brother with a very HAPPY BIRTHDAY! He knows how much I love him. Gotta stop here, I can't control myself! 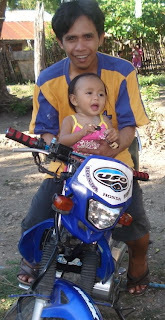 My younger brother and his daughter "Dezaneth". He's 24 today and his daughter will be 2 yr old in September. I can't wait to see my niece. She's so cute as you can see in the pic. We have the same sentiments on siblings. I helped one of my sister too to go to college but after two years she quit and said she wanted to work but then puro pasaway lang ang ginawa. 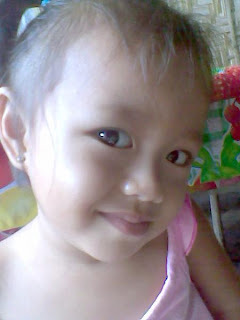 Now may anak na sya, nakay mama pa nakatira.. kakadisappoint ano..
BTW, would u mind exchanging links with me? Please let me know ok. Passing by here sis. Musta? Im here sister...thanks for the visit pla. happy b-day to ur bro dezz..sorry now lng me k visit here very bz sa work..have a nice day.. Happy Bday to your bro sis..
he's very lucky to have a very loving sister like you..
that's sad, dezz. you are such a very caring and loving sister. i can understand your sentiments. i would also feel bad if i am in your situation. i'm sure deep down your brother's heart, he appreciates all that you've done for him. now that he's got a family, make him stand on his own. helping him all the time won't do him any good. he's got to be a responsible man of the house. Thanks guy for the very kind words. I am trying to accept the reality, but sometimes it's just hard to put it away! Appreciate all the responses above.